﻿Services and treatment plans are generated on individual patient needs. ﻿They are established to help our patients return to normal activities as quickly as possible. We use different modalities to diagnose the foot/leg problems. We use a variety of treatment modalities to help our patients return to activities. • A corn is an area of thick skin found in pressure areas or areas of high friction. They can be quite painful if left untreated as they have a central core known • Corns typically form on the bottom of our feet or interdigitally. At Active Feet Podiatry, we can treat these corns by enucleating the core and heavy callous and often this is completely painless. Corns and callus can be caused by the way we walk or shoes that are too tight. At Active Feet Podiatry we will not only remove the corn but we will also establish the cause. We will educate you and give you the best options for future prevention. Ingrown Toenails (Onychocryptosis) are commonly seen by podiatrists and may affect people of any age. They can be very painful and if not treated quickly, often result in infection. An ingrown toenail is a portion of nail, otherwise known as a spicule that pierces the edge of the skin, resulting in inflammation and pain. Quite often if a patient presents with an acute case then it is simply a matter of removing a small section of nail. This if often painless, however local anaesthetic can be provided. If the ingrown nail is a reoccurring problem Nail surgery may be discussed. What does nail surgery involve? A “Partial Nail Avulsion” (PNA) is a minor nail procedure, which is designed to permanently fix ingrowing toenails. The procedure takes approximately 60 minutes from start to finish and involves the use of local anaesthetic. During the procedure a small section of the toenail is removed and an acid known as Phenol is applied to prevent re-growth. Prior to any surgery your podiatrist will conduct a thorough assessment of your general health, which will involve questions about your current and past medical history (including medications). Your podiatrist will educate you on post surgery care. Usually it involves re-dressings at home and a follow up appointment with your podiatrist to make sure that your toe is healing well. For the first few days we advise you on pain relief, what shoes to wear and activity modification if necessary. Diabetes is a metabolic disorder, which can affect the eyes, heart, kidneys and feet. In particular to the feet the nerves may become damaged and cause lack of feeling in the feet, otherwise known as peripheral neuropathy. If this occurs patients will not be able to detect trauma to the feet, which may result in wounds and ulcer development. Diabetes can also affect the blood vessels, causing blood supply travelling to the feet to become diminished. Coincide with neuropathy and this can have detrimental affects to the health of your feet and in particular safety of your feet. Although diabetes can have serious affects on the feet with the proper care, many of these complications are preventable. At Active Feet Podiatry we conduct annual assessments for all of our patients with diabetes and continue with regular diabetic foot checks and cursory assessments. A bunion, otherwise known as HAV (Hallux Abducto Valgus) is a type of digital deformity that occurs in the great toe (Hallux). The cause in some cases is unknown, however it is often referred to as either being a mechanical or non mechanical problem. These include genetics, anatomical structure and positioning of the first metatarsal, footwear or trauma. Bunions can cause an array of painful complications such as other digital deformities, pressure areas and painful gait (walking) or problematic footwear fitting. 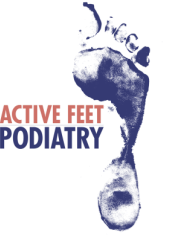 Here at Active Feet Podiatry we are happy to discuss treatment options that are available either being conservative or provide suggestions for surgical intervention. Rheumatoid arthritis affects the synovial lining of joints throughout the body. In some cases the damage to the joints can cause dislocation, making movement of these joints very painful. When joint deformity occurs in the feet, it creates increased pressure areas that are not normally sustaining such forces leaving painful and high risk areas. A thorough assessment, and the prescription of orthotics either off the shelf or customized can often relieve painful arthritic pressure areas.